Autodesk (NASDAQ: ADSK) announced that its Autodesk Gallery at One Market in San Francisco and newly renovated office space in the historic Landmark Building at One Market has received Platinum certification in the U.S. Green Building Council’s LEED for Commercial Interiors (LEED-CI) rating system. The Autodesk offices are one of only four Platinum-certified projects in San Francisco, and second in the state of California under the commercial interiors rating. While IPD requires high levels of collaboration, BIM serves as a decision-making platform that facilitates collaboration and makes IPD possible,” said Phil Bernstein, FAIA, Autodesk vice president of industry strategy and relations. “These are concepts that we believe will change the future of the industry, and we felt it was important to use both of these methodologies as we are also advocating their use to our customers.”One of only a handful of IPD projects across the globe, the San Francisco renovation overcame many of the common obstacles in the architecture, engineering and construction (AEC) industries, including material waste and procedural inefficiency. This IPD approach enabled the teams to fast-track the design and construction schedule and achieve the ambitious LEED Platinum certification. In the LEED Platinum space is the Autodesk Gallery at One Market, which showcases the work of Autodesk customers and illustrates the role of software in great design and the process that takes an idea and turns it into a reality. The Gallery highlights over 20 highly visual projects, such as the California Academy of Sciences, a Ford Shelby GT500, an 8.5 foot LEGO dinosaur and the San Francisco–Oakland Bay Bridge seismic retrofit. The Gallery is a location where designers can discuss the latest in technology and be inspired by others' work. Autodesk also completed the first IPD project in New England, a 65,000-square-foot office building in Waltham, Massachusetts, that contains the headquarters for its AEC industry group and the Autodesk Gallery Boston. Using the Autodesk Revit platform, the architecture and contracting firms were able to create coordinated, digital design information and documentation, and use that information to more accurately predict energy performance, as well as appearance and cost. Autodesk is in the process of seeking Platinum LEED for Commercial Interiors and LEED Gold Certification for core and shell. 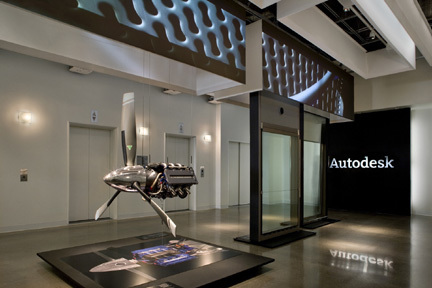 The Autodesk Gallery Portland highlights customer examples from the manufacturing industry and exhibits the most advanced Digital Prototyping technology for the automotive and transportation, consumer product and industrial machinery markets. The Autodesk Gallery Portland has recently received LEED certification. The Autodesk Gallery at One Market is open to the public on the first Wednesday of each month from 1 to 5 p.m.